The death toll of Indians in the Haj stampede has risen to 101 even as 32 nationals still remain missing after the last month's tragedy. 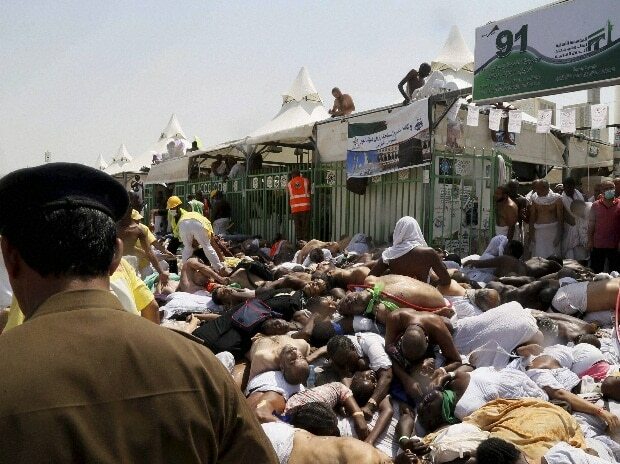 "Saudi authorities have identified more pilgrims who died in Haj stampede. The toll of Indian pilgrims is now 101. We have 32 missing," External Affairs Minister Sushma Swaraj said on twitter today. Minister of State for External Affairs V K Singh was in Saudi Arabia for the identification process of the missing Indians by the Saudi authorities, MEA Spokesperson Vikas Swarup had said yesterday. "The minister sought the intervention of the Saudi Health Minister to find the identities of all the Indian pilgrims. He also conveyed that several missing cases were still pending with the Indian mission and it can only be resolved after the identification process is complete. Singh has been assured of all support and assistance by the Saudi minister," he had said. The Haj stampede on September 24 broke out after two massive lines of pilgrims converged on each other from different directions at an intersection close to the five- storey Jamarat Bridge in Mina for symbolic stoning of the devil. It was the second major accident this year for Haj pilgrims after a construction crane collapsed on September 11 at Mecca's Grand Mosque, killing over 100 people, including 11 Indians.